This beautiful wedding featured many shades of pink, gold and silver. 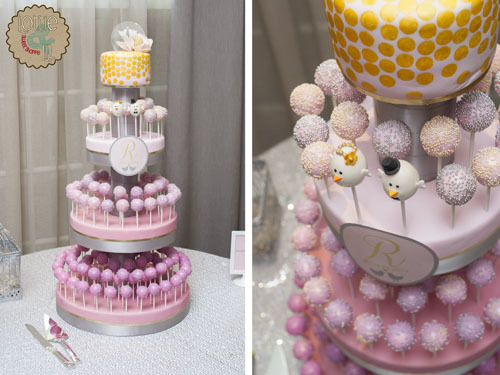 Each tier of the display as well as the cake pops were a different shade of pink. The ombre effect started with the top cake tier covered with gold shimmer polka dots and continued to the deepest shade on the bottom. 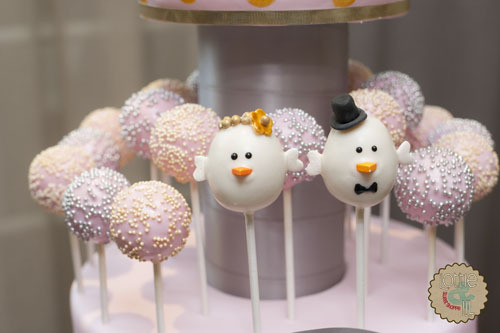 Little bride and groom love bird cake pops were the special pops for the happy couple. Tiffany Cake Pops with a Star Wars Touch! This entry was posted on Monday, July 27th, 2015 at 8:19 am	and is filed under Wedding Pops.